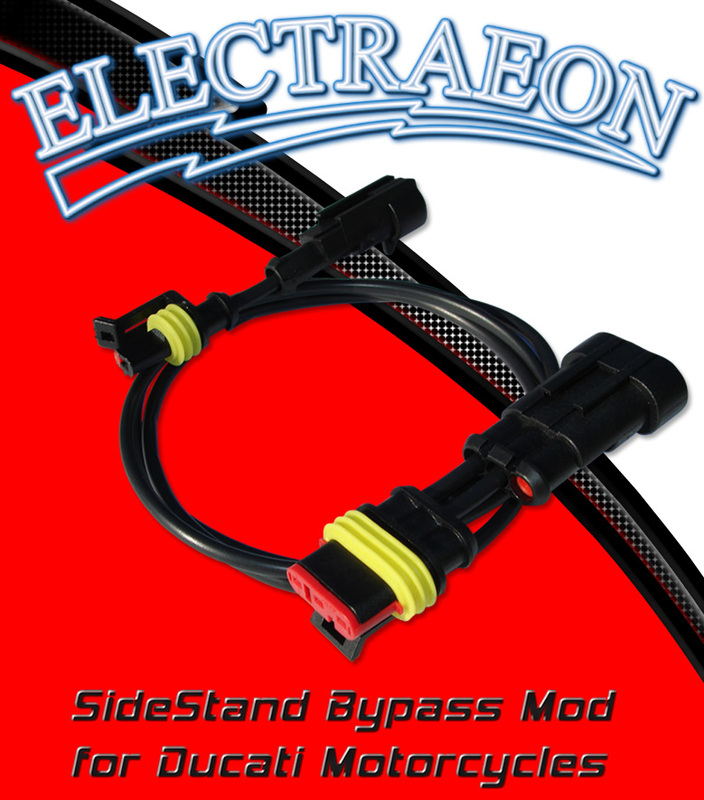 Electraeon SideStand Bypass for Ducati motorcycles. The Electraeon SideStand Bypass mod allows the engine to be started when the side stand is down and the transmission is in neutral. If the transmission is put in gear with the side stand down the engine will shut off, preventing riding away with the stand down. The SideStand Bypass mod does not require any alteration of the wiring harness, no cutting, splicing, or T connectors. And it's appearance exactly matches the stock harness for a factory look. The mod is constructed from the finest quality materials available including AMP sealed connectors (the same parts that Ducati uses in the stock harness). MIL spec. "EE" Teflon wire that is chemical, corrosion, oil, gas resistant, flame retardant and rated to 200 degrees C. The Teflon wire is encased in a abrasion resistant outer shield that is also chemical, corrosion, oil, gas resistant and flame retardant. The electronics are corrosion resistant, encapsulated in silicon sealant and sealed in double wall shrink-wrap tubing. Installation or removal takes 10 minutes and does not require any tools or mechanical skill. Simply remove the side panels (748/996/998, ST2/ST4, Supersport) or lift the tank (Monsters), plug the mod in, strap it in place with the stock rubber band fasteners, and test for proper operation. Complete, detailed, illustrated instructions are included. Versions are available for each of the following 2000 - 2002 year model Ducati motorcycles: 748/996/998, ST2/ST4, Monster, Monster S4, Supersport half fairing, and Supersport full fairing. The Electraeon SideStand Bypass mod has been continuous production for over 18 years and is enjoyed by thousands of Ducati owners. Over the years others have attempted to copy our design but none have ever matched the quality of the original. Designed and built to last the lifetime of the motorcycle. Shipping to USA via USPS First Class is $5. Shipping via USPS First Class to most other countries is $13.50USD.